Don't Just Play Barbie, Be Barbie! : Happy Birthday! Barbie is 49 and she looks fabulous! I am guilty. My Barbie-sensitivity is showing. Kimora Lee Simmons Barbie Arrived Today! How many different Barbies have been made? Happy Birthday! Barbie is 49 and she looks fabulous! At the International American Toy Fair in New York on March 9, 1959, inventor Ruth Mosko Handler unveiled one of the most loved, emulated, and criticized toys of the 20th century. The Barbie Doll, named after Handler's 15-year-old daughter, rocketed the Mattel company to nearly overnight success and became an icon of American culture. 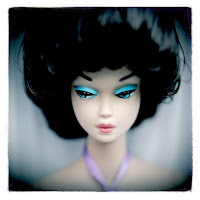 Although Barbie has been roundly condemned by feminists as promoting an unrealistic body shape to young girls, Handler originally conceived the doll as a way for girls to imagine their futures as adult women. "I believed it was important to a little girl's self-esteem," she later said, "to play with a doll that has breasts." 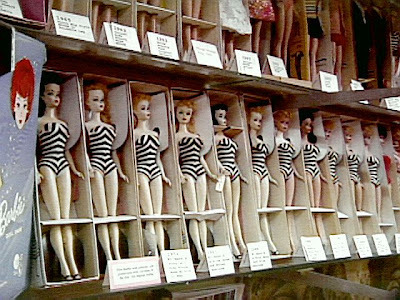 The development of the doll was also influenced by Handler's daughter's preference for adult paper dolls over the baby dolls that then dominated the toy market. 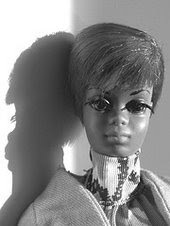 Although it was Mattel's first big success, the Barbie Doll was not the beginning of Handler's career as an inventor. While working at Paramount Studios in Hollywood, Handler first went into business with her husband producing picture frames. Mattel, named for Handler's husband and a business partner, was incorporated in 1945. In its early years, the company produced a toy ukulele and toy guns; it was among the first to market toys directly to children, sponsoring a year's run of the Mickey Mouse Club television show. After the runaway success of Barbie, the company added Ken, named after Handler's son, and later additional dolls named for Handler's grandchildren. After losing a breast to cancer in 1970, and leaving Mattel in 1975, Handler turned her attention to helping other breast cancer survivors. Unhappy with the available breast prostheses, she invented her own, which she sold through a new company called Nearly Me. Handler received numerous awards for her accomplishments. The Los Angeles Times named her Woman of the Year in Business in 1967, the United Jewish Appeal named her its first "Woman of Distinction," and the Toy Industry Hall of Fame inducted her in 1985. Ruth Mosko Handler died in 2002. 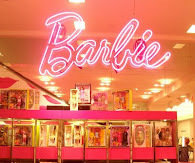 Although often a subject of satire and social criticism, Barbie lives on, with more than 100 million sold annually. Professional outfits and ethnic Barbies have updated the original, but the grown-up doll continues to entrance both young girls and older collectors. Sources: Ruth Mosko Handler, Dream Doll: The Ruth Handler Story (Stamford, CT, 1994); http://www.ideafinder.com/history/inventors/handler.htm; Jewish Women in America: An Historical Encyclopedia, pp. 591-592; M.G. Lord, Forever Barbie: The Unauthorized Biography of a Real Doll (New York, 1994); Los Angeles Times, December 12, 1967, December 15, 1967; New York Times, April 29, 2002. Jewish Women's Archive. "JWA Presents 'This Day in History' - March 9, 1959, Ruth Mosko Handler Unveils Barbie Doll." <http://www.jwa.org/this_week/03/09/Ruth_Mosko_Handler/index.html> (March 9, 2008).